It was a warm day out, the suns gleam shined down upon the earth warming it's core. This day in particular was not out of the ordinary, but would hold many things in the day, only hours could tell all. A shinobi wrapped in black clothing walked down a dirt path, her cloak loosened a little so she could take it off quickly in case of an encounter. Speaking of which, her crimson eyes gazed up from the ground upon hearing a noise in the distance. Her keen ears could ear footsteps up ahead as her nose twitched a little. Their scent was unfamiliar and couldn't be described, but she would surely cross paths with them, surely there was 2 heading this way. 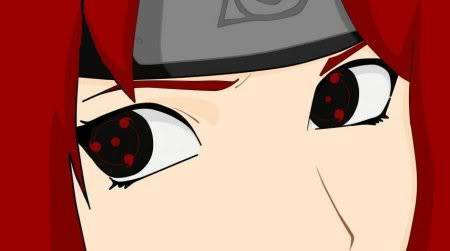 When the two approached in the distance, she could see on both of them that they were wearing akatsuki robes. Miharu could care less about the search of the Akatsuki everyone flipped out over, but she was intrigued to know more about them. Silently, her hand skimmed over her blade that was held at her waist as she smirked, showing her canine teeth. "Nnn, dinner..." she whispered to herself, assuming her demon was getting hungry to eat a couple of humans after all. I was walking with my partner not to far from the Akatsuki Hq we were on our way back from a mission. I stayed silent for a moment befor jumping up onto a rather large rock to get a veiw of things around. I smiled wide before glancing off into the distance. I saw a girl standing there. She seemed odd. "Hey Tooobii..." I began saying his name in a rather hyper manner. "Theres a random girl over there, she seems odd that one." I sead rocking from my toes to my heals then leaning forward to get a better look. I then jumped of the rock next to my partner waiting for what to do next. 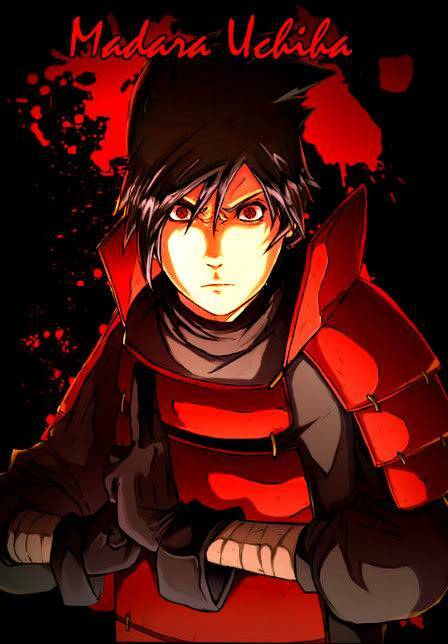 Tobi looked ahead the sharingan in his mask piercing to the woman standing off in the distance. Tobi looked closer and nodded "She looks like she is waiting for us." Tobi looks down at his partner and smiles beneath his mask. "Seems we may get to have some fun." He rocked a little in place before continuing on there path right for the woman. The woman scanned her surroundings, in case they tried to escape their was plenty of trees to flee through, but no buildings around could they stop at, they would have to keep running as an escape til they reached the next town. Licking her lips sinisterly, Miharu decided to keep herself calm and collected upon approaching them. She then removed her hood, revealing her wavy brown hair and brown eyes as she fixated a gaze on them. She parted her lips to speak, only to speak in a nice manor and not to anger them in any way. "Evening, miss," she looked at the female. "Sir." she finished then looking at the male, then at both of them. I looked to the girl then at Tobi and back again. I then smiled and waved at her childishly.I continued to stand in my place. while one hand waved the held tightly a syringe in case the girl was trouble. The wind began to blow slightly making my hair and cloak wave slightly to one side. The trees were creeking and no animals were wandering around the area. I found this slightly odd seeing as usually the area was filled with them. I wondered if it had to do with the girl. I walked forward slightly keeping my nice sugar coated apperance. Tobi stood quietly not trusting the look of the girl in front of them. In his cloak his hand griped a kuni as his sharingan scaned the girl watching for the slightest movement or sign of a jutsu. His body was rocking back and forth making himself look harmless and child like. "My name?" she thought on it, giving her name was after all common courtesy but she didn't want to really give it out, but decided to make an excuse so she didn't have to. "It's nice to say your name first you know. Where's your manors?" she grinned and crossed her arms. The girl looked of slight interest to her, by the look of it she wouldn't back down if they were to intrigue in a fight. Now the man, he seemed child like and playful, but even so looks can fool you, so she would not take him so lightly. She then chuckled. "Fine, my name is Miharu Hachiko. But, I don't think you'll find any bit of that information of an importance to you. Now, care to introduce yourselves...?" she raised an eyebrow, awaiting their responses. It was slightly striking her as off, both of them were akatsuki yet they were the ones who stopped her, when it should be the other way around. Something clearly was not right in this picture. I stood there for a moment after she gave her name to us. I was almost surprised by this. I then smiled. "Nice to meet you then, Im Raita." I gave my name to her being fair. I stood in my place continuously then proceeded to yawn with bordom. "So, what are we doing here again?" I asked looking over to Tobi with a look of question. My eyes were slightly closed as if i was falling asleep but a small smile kept its place on my lips. Tobi hoped up and down his child like persona rushing out. "Tobi is me." He rushes forward holding out his hand in greeting. "nice to meet you." He said still rocking back and forth. "You know its scarry out here lots of super bad people around." He nods looking to Raita. "Nice to meet you, Raita, Tobi." she said after shaking his hand then looked at them. Her demon inside her was ranting and complaining for her to attack them but for some reason she felt uneasy about doing something like that. Even when hearing Raita claim to not know what they were doing a place like this, well they must have been more absurd then she would have guessed. Letting out a soft sigh, Miharu rubs the back of her neck from the irritation and anger rising from the obnoxious monster inside her body. I could since something off about the girl but only smiled as my partner looked back at me I then nodded agreeing with Tobi's words. I then walked closer to them holding out my free hand for her to shake. "So, what are you doing in a place like this?" I asked Miharu. As tobi took Miharu's hand his eye glowed slightly feeling a deep hunger and want for destruction. Tobi let go of her hand not dropping the persona a second he steeped back rocking once more giving the illusion he was the underling of the two. "Um..." she wasn't sure how to clearly put it. Telling them that she was going out and killing humans just to feed her demon wouldn't be the proper way to go. But making up excuses wasn't her exact forte, either. She bit her lip thinking of something to say. "Well, I guess you can say I'm hunting." That was the only thing she could think of at a last minute thing. When shaking their hands something about the man gave her a bad vibe where as the female was the same, but not as bad. Just by a firm shake it is told you can tell the exact strength of ones possesion. If that had been true, it may be some difficulty. Sliding her hands in her pockets, she looked at them slightly bored. "So, not to be rude or anything, but you Akatsuki I hear aren't the nicest of people around, which strikes me as off..."
I looked at Miharu once more knowing now she knew of who we were, however it was not that big of a surprise seeing as almost everyone did. I smiled once more. "Not all of us are evil scary monsters...." I said plainly. I then looked around spacing off into the distance. I was bored and it was showing. The wind again began to pick up and it began to rain. The first raindrop hit the tip of my noes causing me to try and look at it. Tobi stood there not many would see it but he seemed to not be getting wet at all the rain seemed to go through him as he rocked back and forth seeming so young. "Nope nope not all bad, Tobi a good boy." He said with a child like happiness not many knew who waited under the child like act and orange spiraled mask only his trusted advisers knew who Tobi really was. "Alright..." she said going along with it. They didn't seem like to bad of people, and she wasn't in the mood to kill people like these. Might as well be friendly and not cause a ruckus. When Tobi said his usual line i found my eyes shoot twords the swirly mask man. I then giggled slightly and thought to myself how not true that was. I then looked back at Miharu. "can we go home now?" I whined now becoming soaked by the rain. I hatted rain and didn't want to be any wetter than i was already. "Well it was nice meeting you but I must find some shelter, I really do hate the rain, and I mean really..." she said, since after all Miharu's Jutsu mainly consisted of Katon she much rather liked fire compared to water, almost enough to loathe it. She gave one final wave, then began to walk past them. I looked at Tobi as if to ask if she could stay with us. But said not a word as she past just in case it wasn't ok. After all i could feel the amount of power she had and i thought she would be a good asset if we could gain her trust completely. o____O was the expression she gave off as Tobi suddenly grabbed her and practically dragged her. "H-Hey!" she bolted then regained her foot stepping and walked the right way, turning around to face him. She was grateful that they offered her a place to stay for now but she wasn't certain if that was the best of ideas since she hadn't known them all that well. But, she reluctantly came along for a reason unknown to her. I chuckled slightly at the look on Miharus face when Tobi began dragging her. Once she escaped him i walked up behind her and hugged her. I the smiled. "You can stay with me in the secret place. You'll be save there. It'll be fun." I said excitedly. Tobi walked with them happily than stoped looking around. "Something is wrong." Tobi said his body getting stiff looking around.